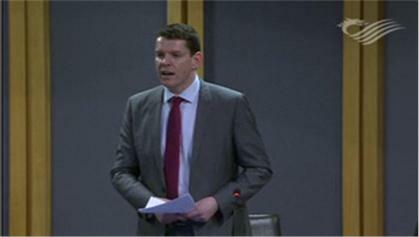 Ynys Môn AM Rhun ap Iorwerth yesterday raised the plight of Anglesey classroom assistants and other school support staff in the National Assembly for Wales. “Plaid Cymru’s proposal is to put in place a national framework, not only for teachers’ pay, but also for the whole school workforce. That framework, I believe, would certainly be a means of avoiding one problem and issue of unfairness that has raised its head, as it happens in my constituency at present, where there is great concern among classroom assistants on the future of their posts as a result of the job evaluation process carried out by the local authority. Of course, I support the principle of the process undertaken by the council to ensure that there is consistency in terms of salaries across the authority — the principle that similar jobs should have similar pay — but, one of the unfair outcomes of that process is that classroom assistants and other support staff in schools have been informed that they are to be treated as part-time workers in future. “The standardisation of salaries has happened on an hourly pay basis. As the school is only open from 9 a.m. until 3.15 p.m. and that there is more leave for school staff than other staff, because the school is closed for longer periods of holiday, the conclusion was that these support staff should be paid pro rata for the hours that they work, and that, it must be noted, took no account of the additional work that these staff do after school with Urdd activities and so on.